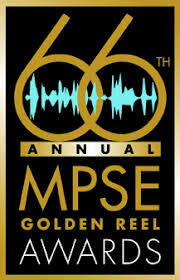 Honoring outstanding achievements in sound editing, the 66th Annual Motion Picture Sound Editors (MPSE) Awards took place on Sunday, February 17th at the Westin Bonaventure Hotel in downtown Los Angeles with over a thousand in attendance. Golden Reels were handed out in 23 categories encompassing feature films, long-form and short-form television, animation, documentaries, games, special venue and other media. In his opening address, MPSE president, Tom McCarthy, commented, “We are storytellers who serve filmmakers and producers by creating immersive audio experiences that wrap audiences in visual landscapes and dialog-driven stories on screens around the world.” McCarthy also announced the creation of the Entertainment Industry Professional Mentoring Alliance (EIPMA), an organization devoted to nurturing the next generation of diverse filmmakers. 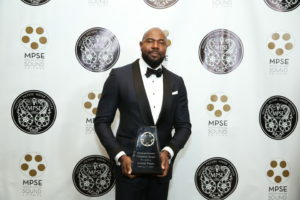 “Sound is important to cinema, it is half of the experience,” said A Quiet Place supervising sound editor, Ethan Van der Ryn, in accepting the Outstanding Achievement in Sound Editing – Effects/Foley for his team that included supervising sound editor, Erik Aadahl, MPSE; sound effects editors, Brandon Jones, Justin M. Davey, MPSE; foley artists, Steve Baine, Peter Persaud; and foley editor, Jonathan Klein. Bohemian Rhapsody took two of the top feature awards garnering Outstanding Achievement in Sound Editing – Dialogue/ADR and Outstanding Achievement in Sound Editing – Musical for supervising sound editor, John Warhurst; supervising ADR/dialogue editor, Nina Hartston; ADR/dialogue editor, Jens Petersen; supervising music editor, John Warhurst; and music editor, Neil Stemp. Spider-Man: Into the Spider-Verse went home with both Outstanding Achievement in Sound Editing – Feature Animation and Outstanding Achievement in Sound Editing – Music Score. The team includes supervising sound editors, Geoffrey Rubay, Curt Schulkey; sound designer, John Pospisil; sound effects editors, Kip Smedley, Andy Sisul, MPSE, David Werntz, Christopher Aud, MPSE, Ando Johnson, Benjamin Cook, MPSE, Mike Reagan, Donald Flick; dialogue editors, James Morioka, Matthew E. Taylor; foley artists, Gary Hecker, MPSE, Michael Broomberg, Rick Owens, MPSE; and foley editor, Alec Rubay. 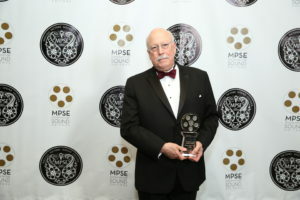 The MPSE Career Achievement Award was presented to supervising sound editor, Stephen H. Flick, by Academy Award-winning supervising sound editor, Ben Wilkins. Forty years of work on more than 150 films was condensed into a 6-minute clip reel, which also exemplified the evolution of sound over almost half a century. Actors Edward James Olmos, Kirsten Vangsness (Criminal Minds) and Jasmin Savoy Brown (Sneaky Pete), presented the feature film awards. Additional awards presenters included: sound designer/MPSE board member (China) Shasha Dong and sound designer/MPSE board member (India) Resul Pookuty; Spider-Man™: Into the Spider-Verse producer, Christopher Miller, and producer/co-writer, Phil Lord; production mixer and president of the Cinema Audio Society (CAS), Mark Ulano, and actress Libe Barer; Hollywood Reporter tech editor, Carolyn Giardina, and Netflix partner engagement, Frances Chu-Fong. Stacy Milner, entertainment career strategist and author of “Leveraging UP!” and Fabienne Rawley, board member of the Entertainment Industry Professionals Mentorship Alliance (EIPMA), presented the Verna Fields Student Filmmaker Award.